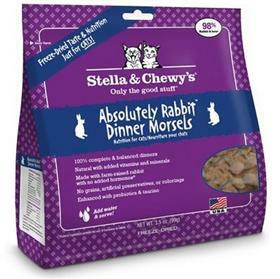 Satisfy your kitty’s craving for real meat with Stella & Chewy's Freeze-Dried Raw Absolutely Rabbit Dinner Morsels Cat Food! Fresh, farm-raised rabbit is the main ingredient used in this raw, antibiotic free dish. This feline favorite delivers unparalleled high protein to your best pal’s bowl without adding grains or preservatives that cats can’t digest. Plus, Stella & Chewy’s is all-natural and minimally processed with limited ingredient diets and added taurine to promote silky soft fur and healthy skin. Cut the unnecessary carbohydrates and give your kitty what they crave!